Setting up shop at a trade show or convention? 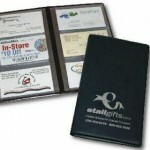 Give your visitors something they’ll hang onto and keep your company name top of mind. Visitors to tradeshows collect business card after business card. Why not let BRAVA Marketing Promotions help you provide visitors to your booth with a simple yet efficient and classy way to keep all their cards neat and organized? Imagine the average tradeshow visitors walking around with pockets and pocketbooks loaded with business cards. They reach your booth and you solve their problem by giving them this handy storage case. Who wouldn’t be thankful to you and your business for coming to their rescue? And, of course, each time they glance at the cover of this stylish business card file case they’ll see your company’s name and logo.